Our Party Tents are perfect for any kind of events and celebrations. 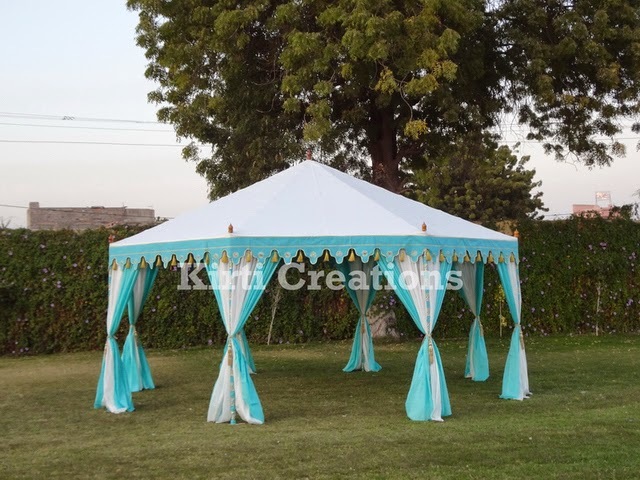 Party Tents comes in various shapes, colors and sizes. We can make your celebration more dazzling with our elegant tents. 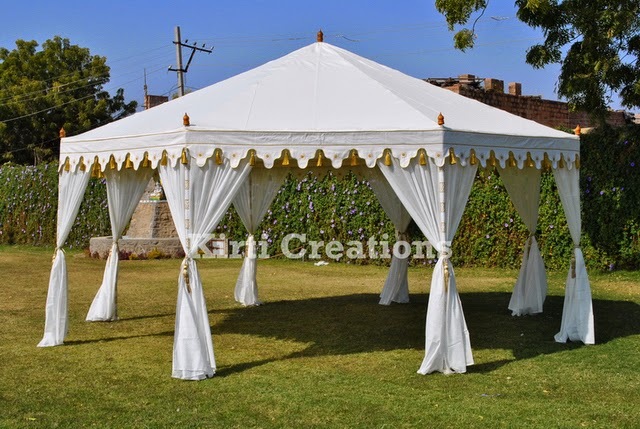 Raj Tents manufacturing company is known for its elegant and magnificent tents in all over India. We use latest designs and innovative ideas for tent making. Our canvas is made with cotton material. Our tents are water and fire resistant. We accessories our tents with stylish lanterns and royal sitting arrangements. Our tents are safely assembled by our expert team. 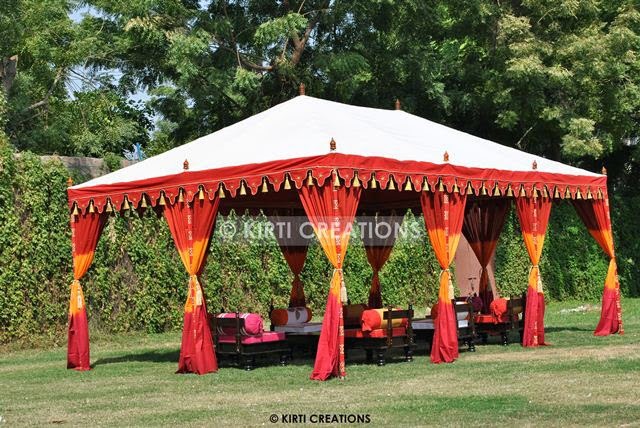 Special Party Tents:- Special Party Tents is famous for its unique design. It is adorned with exquisite borders. Lovely curtains are wrapped around poles. The vibrant color combination gives it a phenomenal look. It can be easily assembled and disassembled. 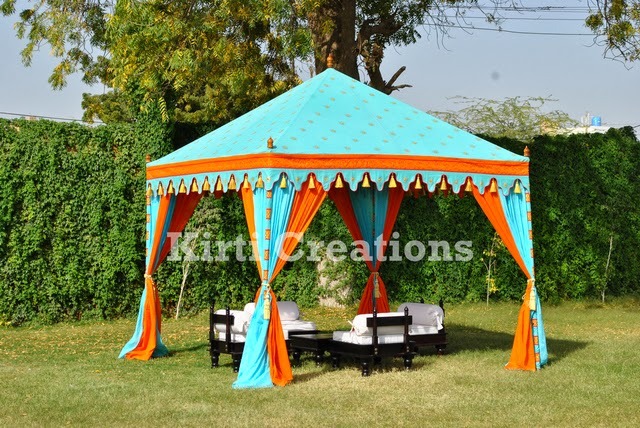 Stylish Party Tents can make your event stylish and happening. This tent is made up of superb quality material. The decorative borders and elegant curtains give it a unique look. It is durable in nature in rough weather conditions and it is fully supported by ropes and poles. Luxurious Party Tents:- Our Luxurious Party Tents can make your event fabulous .Our tent will give you an incredible experience. The elegant look of the tents can make your event memorable. It known for its durability and fancy color combination. The artistic borders and designs beautify the tents. It is suitable for all kinds of functions, parties and celebrations. · Perfect tent for birthdays, parties and many more. Party Tents can make your function more stylish and lavish. Party Tents are durable in adverse weather condition. Our tents are exclusively made for parties and functions. Raj Tents can make your event more special with its fabulous looking tents. We design our tents according to the customer requirements. 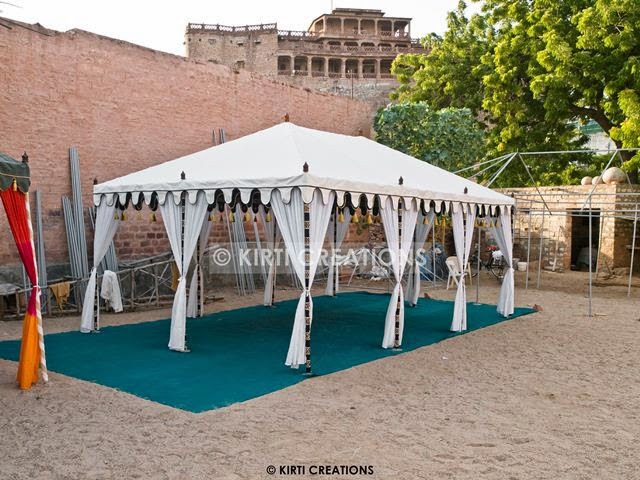 Raj Tents provide tents for all kind of celebrations, parties and weddings at reasonable rates. Party tents is suitable for any kind of events and celebrations. We offer wide range of stylish and beautiful tent that adds glitters to your celebrations.Party tents comes in different shapes, colors and sizes. 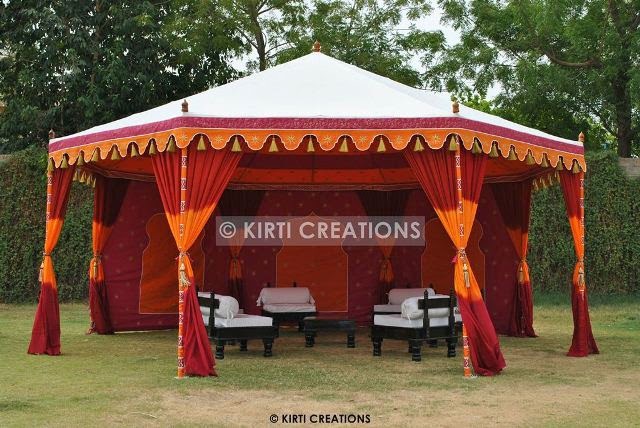 Traditional Party Tents:-Traditional Party Tents is known for its ethnic design and suitable for grand parties. It can accommodate large number of people. It is known for its perfect color combination. The vibrant color and design give it a traditional look. Handmade Party Tents:-Handmade Party Tents are available in various sizes and specifications. It is a beautiful tent and it one side is closed. It can be easily setup. It is perfect for any kind of celebration.It is decorated with artistic borders that provides unique look. Lavish Party Tents:-Lavish Party Tents are hut shaped tents and it is open from all sides. It is blue and white in color. The gorgeous curtains around the poles give it an extra ordinary look. It is suitable for birthdays, parties and many more. Aesthetic Party Tents:-Aesthetic Party Tents is known for beautiful and subtle look.It is white in color. It is capacious and comfortable. It is used big parties and events. It is durable in adverse weather conditions. Party tent can make your function more stylish and lavish. 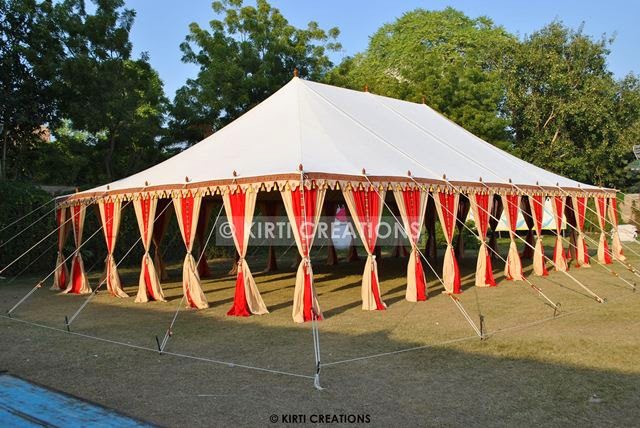 Party tents can make your event more special with its fabulous looking tents. Raj Tents provides gigantic tents which are durable in bad weather conditions. We provide tents for all kind of celebrations, parties and weddings at affordable rates. We believe in providing a quality product to our customer. Party Tents is offer exclusive design and pattern when it is set up, that tent is take few time for installion and you can easily purchase from anywhere. 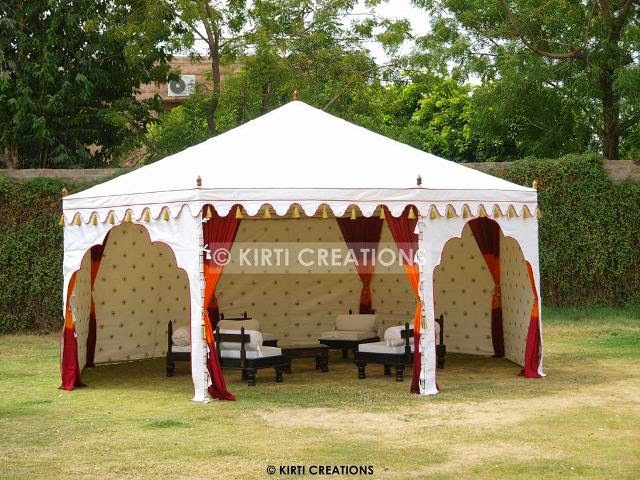 Indian Party Tents:- Indian Party Tents is design in white and purple color of marquees and host a parties in a beautiful way and it is protect you against sunrays, winds and rains. Classic Party Tents:- You choose Classic Party Tents for stylish parties because it’s border and design is unique and make a best tent for all types of parties. 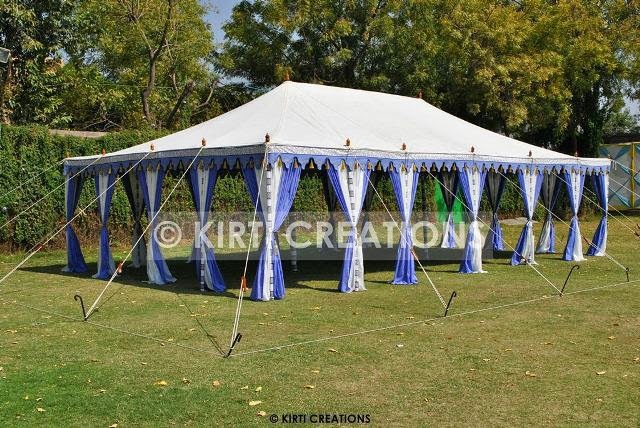 Handcrafted Party Tents:- We serve Handcrafted Party Tents to our customer in all size, and it is good option for party. These type of tents is covered printed canvas at the back sides. 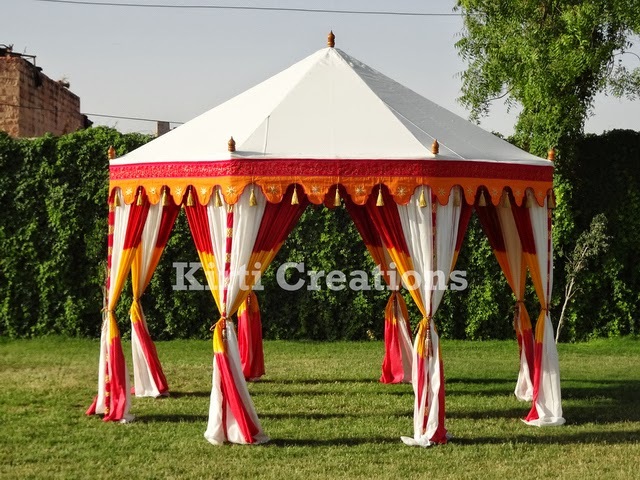 Party Tents is perfect for all types of parties whether parties can be large or small, Raj Tents offer custom Party Tents for our respected customer. Raj Tents manufacturing company is included in top list. Wishing you a colorful Holi…………………….